I am really not able to believe that I am writing ''100th recipe''. I had never thought I could write a blog on recipes. I should thank my dear hubby for encouraging and supporting me!, he is the one who created a blog spot for me and convinced me to write recipes. Now I really love and enjoy writing recipes. Last but not the least, thank you all viewers for stopping by, joining my site and leaving valuable comments. It wouldn't be so interesting without your support. I wanted to write a special recipe for my 100th post. So I chose Stuffed Okra Recipe. 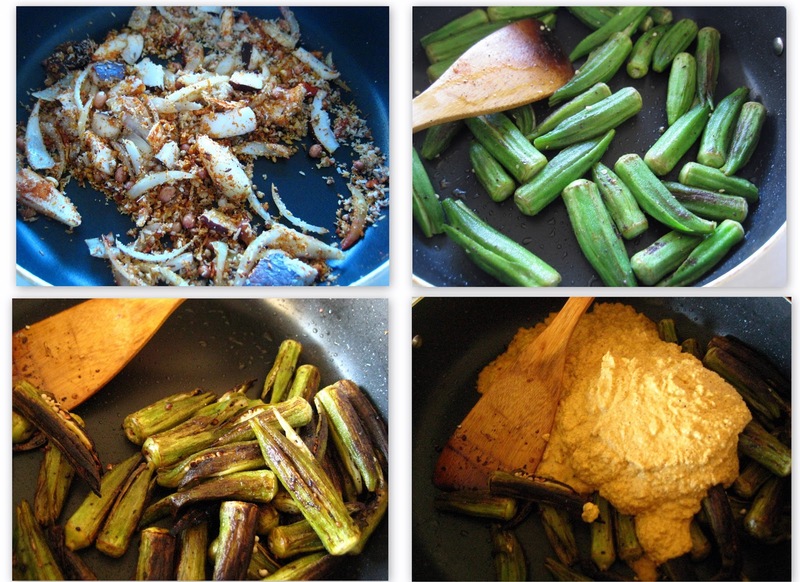 I tried to stuff few Okras with masala, but I couldn't do it as I was lacking patience!!. If you have lots of patience you can go ahead and stuff Okras with ground masala. Its a simple and very easy recipe. It goes super duper with Chapathis and Jolada rotti (jawar rotti). Try it out and have fun. Wash Okras and wipe it with a cloth( make sure okras are dried). Then slice the Okras vertically from the top,turn half way around and slice again without separating form the hull. Heat 1 tbsp Oil in a pan, add sliced Okras, sprinkle some salt and lemon juice. Fry for 10-12( untill fully fried as u see in the pic) min on a medium heat. In the mean while, heat 1 tsp of Oil in an another pan add all the grinding ingredients as in the order. Fry for 2-3 mins. Then grind roasted ingredients with about 1-1 1/2 cup water( do not add too much water). Now add the ground mixture to fried Okra. Add salt to taste, add some water if required..
Cook on a medium heat for about 10 min. Serve with Chapathi Or Jolada Rotti. Congrats on ur 100th recipe dear...Stuffed okra looks delicious. Congratulations Madam. This is wonderfull. congrats on your 100th post too..keep rocking!! Congrats Prabha.. Way to go..I hope Raghu will inspire you to publish a book very soon.. if u have noticed there are very few famous Havyaka cooking books.. so there is a chance for you...:) All the very best..
SHubhashaygalu Prabha..heege adigeya payana munduvareyali!! !